Anyone that’s been reading this blog for a while or knows me, knows that I enjoy encouraging people. Many times in my life when I needed some encouragement, there was no one to be found, besides family, of course. Yet, I longed for more. I wanted to be able to sit down with a girlfriend and discuss the troubles that I was facing. I wanted someone that could encourage me and not just let me wallow in the mud. Instead what I found was a great friend in God. He showed me how much He cared for me and how much He thought of me. Why do I say that? Well, if we look at the Scriptures, it becomes evident that God had us on His mind as the Bible was being written. For a long time, it was a part of my Christian emergency on the go kit. (before the Bible app) I quickly learned that if I needed encouragement, I had to encourage myself through the Holy Spirit and the Word of God. Psalm 91:5-12 (for overall protection) You shall not be afraid for the terror by night; nor for the arrow that flies by day; Nor for the pestilence that walks in darkness; nor for the destruction that wastes at noonday. A thousand shall fall at your side, and ten thousand at your right hand; but it shall not come near you. Only with your eyes shall you behold and see the reward of the wicked. Because you have made the LORD, who is my refuge, even the most High, your habitation; There shall no evil befall you, neither shall any plague come near your dwelling. For he shall give his angels charge over you, to keep you in all your ways. They shall bear you up in their hands, lest you dash your foot against a stone. Psalm 34 (ALL) verse 4: I sought the LORD, and he heard me, and delivered me from all my fears. (I needed to be reminded that the Lord hears me); verses 8-10 (the promise of God for my personal needs and wants); O taste and see that the LORD is good: blessed is the man that trusts in him. ; O fear the LORD, you his saints: for there is no lack to them that fear him. The young lions do lack, and suffer hunger: but they that seek the LORD shall not lack any good thing. James 5:14-16 (A reminder of the power of prayer) Is any sick among you? let him call for the elders of the church; and let them pray over him, anointing him with oil in the name of the Lord: And the prayer of faith shall deliver the sick, and the Lord shall raise him up; and if he has committed sins, they shall be forgiven him. Confess your faults one to another, and pray one for another, that you may be healed. The effectual fervent prayer of a righteous man avails much. As I said before, these are not all of my favorites, but the one that came to my heart to share right now. I hope you have found some encouragement in this. Wow, thanks for sharing these! I never realized how much Isaiah 54 apparently speaks to me, too! 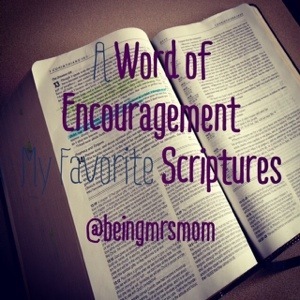 I’m so glad that you found encouragement from this post. Isaiah 54 is one of my favorite scriptures. I apologize for the late response. I had responded previously on my phone, but it obviously didn’t go through. Sorry again.